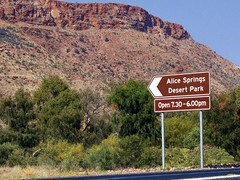 If you have time for only one attraction in Alice Springs, visit the Alice Springs Desert Park. If you can spend only one day in Alice Springs, make it a day at the Desert Park. And if you have all the time in the world? Well, lucky you. Then start your long visit to the Australian Outback at the Alice Springs Desert Park. I'm dead serious. Most people visit Alice Springs to see the "great Australian Outback". And there is no better place to start than the Alice Springs Desert Park. There is a big difference between merely looking at something and actually seeing it. The Desert Park will make sure you see the Australian Outback. What makes the Australian Outback what it is? The landscape, the Aboriginal culture, and the flora and fauna. And the Alice Springs Desert Park is like a botanic garden, a zoo, a centre for Aboriginal culture and an environmental conservation institute, all rolled into one. On top of all that it's located in a magnificent Australian Outback setting at the foot of the MacDonnell Ranges. What I liked best about the park is that it makes learning about the Australian Outback so enjoyable and effortless. All you do is stroll through the different desert habitats, enjoy the wildflowers, admire all the wildlife (there is a lot of it! ), watch the presentations and shows, and before you know you have acquired a real understanding of the Outback and the Australian deserts. You will get just so much more out of the rest of your trip and you will never look at the desert the same way again. You will see and recognise the animals and plants and even some bush foods. You will identify habitats, see where there is water underground, and a lot more. You will also understand how much we humans have already changed this supposedly wild and pristine area. And hopefully, after leaving the Desert Park, you will not accidentally do more damage to this fragile environment during your travels, like a lot of tourist do, simply because they don't know any better. The first thing you see after entering the gate is a staff member who will welcome you and hand you your free audio guide (available in English, German and Japanese). Those audio guides are great. All through the desert park you come across signs with numbers. You just enter the number into your audio guide and press start. Listen to explanations about the habitat you are looking at, sounds of the animals that live here, stories form the early days told by local Aboriginals and so on. You can keep wandering around while you're listening, replay it if you didn't get it all, and there is no need to follow any particular order. Just listen to what interests you, if and when you feel like it. Another thing you will be handed when you arrive is a plan of the park and a time table with all the different shows and presentations. The most popular show is the "Birds of Prey Show" in the Nature Theatre. It's a little amphitheatre and the birds here are totally free in their natural environment. You have to remain seated during the show. The birds come right in, sometimes leaving only a couple of centimetres between their claws and your head. And they're fast! If you've never experienced them hunt that close you don't realise how fast they are. The presenter explains their different hunting techniques and the birds demonstrate them. Awesome. Especially when they don't want to play along and embarrass the presenter, or manage to sneak up on him from behind. Hehe. Don't miss this one (there's one show in the morning and one in the afternoon). There's a huge variety. You just pick what interests you and show up at the meeting point. In between the shows you can wander through the park. And make no mistake. It's huge. I love the bird enclosures, I think there's close to ten of them. They helped me a lot to finally put faces to all the voices in the bush. I know all the birds up here where I live, but the Alice Springs area has lots of birds that we don't get. It was interesting to watch people here. If you want to see birds in the enclosures you need to be still. Just wait and watch, and you'll be amazed how many of them there are. Most people barged in through one door, stomped through and out the other side... Bet they didn't see a single bird. That's what happens when you scheduled only two hours for the park... Did I mention to spend a day here? And then there's of course the nocturnal house with all the snakes and lizards, and lots of rare and endangered animals like the bilby and the mala (rufous hare wallaby). And the kangaroo and emu enclosures. The Alice Springs Desert Park website recommends to take at least four hours for a visit (and also warns you not to be surprised if you end up spending the whole day). There's a cafe and it has a big selection of really yummy food, you won't have to go hungry. So, be smart. Make it a day. To get to the Alice Springs Desert Park just head out of the town centre on the Larapinta Drive and look for the sign post. It's only a few kilometres outside of Alice Springs. The Park is open seven days a week from 7.30 am to 6 pm (except Christmas Day). The entry fee is $20 for adults and $10 for children. (Children under five are free and there are concessions for whole families and for students and seniors). And last but not least, here is a map of the Alice Springs Desert Park to view or download and print.